We thank you for keeping us in your thoughts and prayers these past several months. The SAHARA Project board has been spread across the globe this summer pursuing our career goals in medicine, developmental economics, and community health. We would like to share a brief summary of our summers as well as provide an update of the recent initiatives of the SAHARA Project including our newest project of equipping Compassion Evangelical to fight Ebola. David: David spent the majority of his summer working full time as a Summer Undergraduate Research Fellow in Mayo Clinic’s Biomechanics Laboratory, where he investigated whether transplanted stem cells can improve the healing of lacerated tendons and the cellular mechanisms involved. In addition to research, David studied for and took the Medical College Admission Test and completed the written applications for 23 medical schools across the US. He is now finishing his senior year at Wheaton College, IL. Ashley: Ashley spent the first few weeks of her summer in Turkey with the Hillsdale College Honors Program. She then interned at the Heritage Foundation’s Center for Trade and Economics in DC, where she worked with the team that compiles the annual Index of Economic Freedom, co-published with The Wall Street Journal. She enjoyed the opportunity to learn more about developing Asian economies, analyze Chilean tax and education policy, and assist with research for an op-ed on Ukraine and Russia. Matt: Matt spent the summer taking classes full-time at the University of Minnesota as he works to complete his Economics B.S. along with pre-medical requirements. He especially enjoyed his econometrics and organic chemistry classes and is looking forward to his senior year. Outside the classroom, Matt worked part-time as a research assistant studying HIV care cascade interventions, a project which he is excited to continue throughout the upcoming school year. Hillary: Hillary returned to Minnesota at the beginning of July after spending 6 months helping at Tenwek Hospital in Kenya. 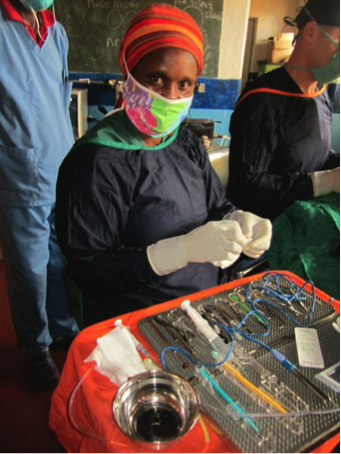 She worked on an esophageal cancer research project, helped the surgical residents write manuscripts, and worked with the Community Health and Development program. She is working at the National Cancer Institute in Maryland this fall. Elise: Elise spent the summer canoeing, hiking, and playing with kids. She worked as a counselor at HoneyRock, a camp in the northwoods of Wisconsin that is owned by Wheaton College. She led daily Bible studies with her campers and as they learned to lean into God, she learned to do the same. In July, the SAHARA Project official received 501(c)3 status with the IRS! Our website is now open to online donations at http://sahara-project.org/donate/. 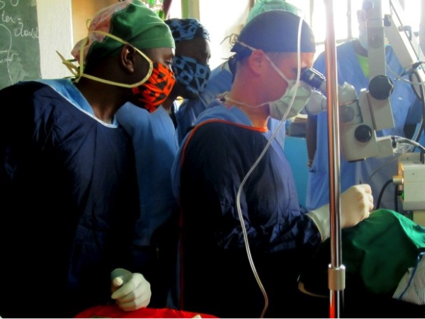 Donations will support Compassion Evangelical Hospital in Guinea as they attempt to contain the Ebola virus that is spreading through the country. (Read more below). 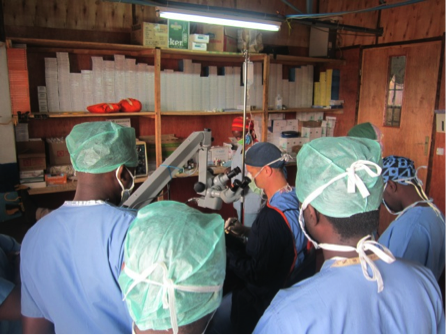 The program director, Dr. John Cropsey, informs us that KHH’s ophthalmic surgical capacity has doubled since the start of the training and that the organization and sterilization systems of the OR are significantly more efficient. 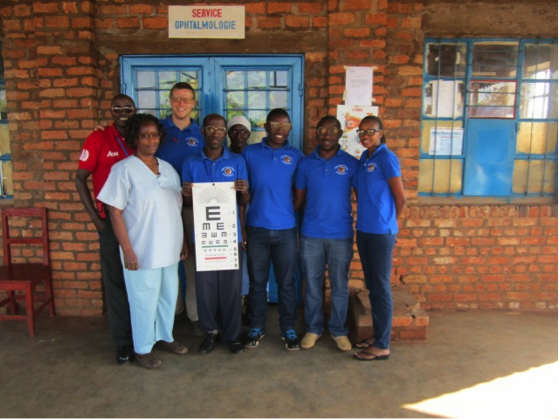 In December, Richard Tonui, the head of community eye outreach at Tenwek, plans to visit KHH to begin the hands-on community outreach training. The staff will learn how to implement the foundational knowledge they have attained thus far in community eye care screenings. As Ebola continues to spread across West Africa, CEH has requested $2000 to purchase much-needed supplies of rubber gloves and chlorine. The supplies will help limit and contain the threat posed by the virus.The risk of infection in that area is still high and we would like to provide the hospital with the requested supplies as soon as possible. Read more here on our blog or donate online at http://sahara-project.org/donate/. Thank you all again for your support, thoughts, and prayers. David Holmes, Ashley Wright, Matthew Merry, and Hillary and Elise Topazian.